Dutch Sleeping Sickness (1914) The Dutch magazine Het Leven ran an extensive photo feature about the outbreak of a so-called tropical "sleeping sickness" epidemic in the Netherlands. The disease was said to thankfully be mild. It simply caused victims to sleep for extremely long periods of time. Shown above is a supposed victim of the disease. It was actually a photo of a fallen statue. Tango-Dancing Monkeys (1914) Crowds gathered outside the monkey cages at the Berlin Zoological Garden, lured there by an article in the Berliner Morgenpost promising that Missy, a female chimpanzee from the forests of Cameroon, would be performing the tango, a skill said to have been taught to her over the winter months by the zoo's director. Her partner would be Karl, a large gray baboon. Both would be wearing ballroom costumes. Eventually the crowd realized what day it was and dispersed. 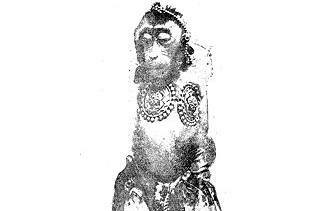 But a few days later, the story of the tango-dancing monkeys was reprinted by a French paper, Le Petit Journal, which had mistaken it for real news. Le Petit Journal reported that the two simians actually danced gracefully in their cage, and were met with wild applause from the audience. 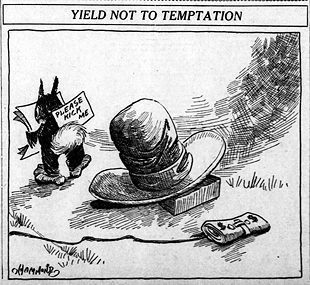 Yield not to temptation (1914) April Fool cartoon published in the Wichita Daily Eagle - Apr 1, 1914.